I always love this time of year, when you know spring is ‘just around the corner’. The days start to lengthen and the mornings are much lighter (so not quite as difficult to get out of bed at 7 o’clock) and one’s heart is gladdened. It’s at this time of year, that I always notice a large clump of snowdrops, which grow on a bank in Burnopfield, not far from my parents’ home. They have cheered my heart on many a winter day. My longtime friend and former colleague, Mildred, has a great love of snowdrops and they have a very special meaning for her. I think she was the inspiration behind this drawing, which also featured a beautiful white bear. My friend, Jennifer A. Stephenson created a beautiful jade-green cape or cloak, for the bear, which I named ‘Sophie’. I photographed the bear in situ but was very careful not to crush the delicate white blooms on the drooping flowers. As usual, I waited until the road was quiet of traffic and set up the scene. Then, as usual, a fleet of buses or a group of cyclists go by and all stop and stare at me, as I do some sketching and take some hasty photographs. The same thing happened on this occasion, which is always very embarrassing for me. I wouldn’t put myself through these torturous ordeals if it is not for the fact that I want to get the effects of shadow and light correct on the bear etc. 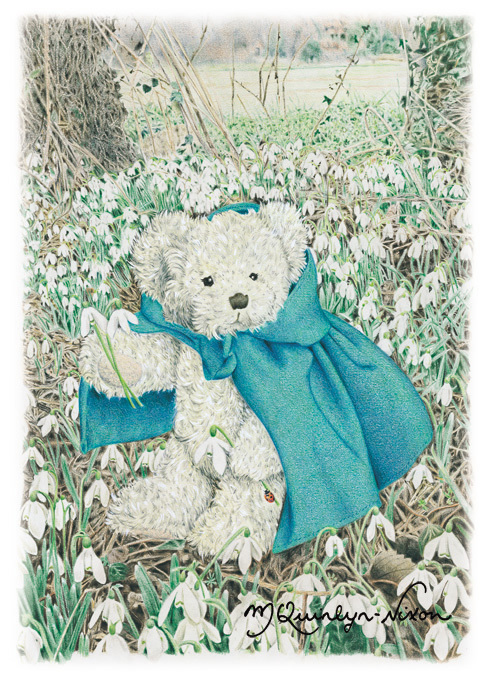 This illustration, like many of them, was time consuming, as the amount of snowdrops could not be rushed. I felt I was well on my way to breaking the record of how many snowdrops could be drawn in the one picture.